Our wooden Hole-in-One Golf Ball Box is the golf ball display case you need for your hole-in-one or commemorative golf ball. 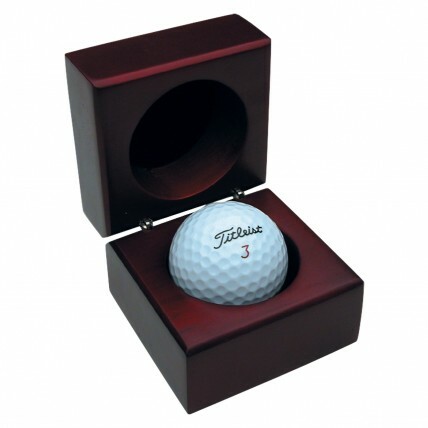 Proudly display your special "Hole-in-One" golf ball, a signed golf ball, or commemorative golf ball in this handsomely crafted and varnished wood golf ball display box. With a brass-hinged lid, it can hold any standard sized golf ball. Golf ball display box is 2.75 inches wide and 2.5 inches tall. Protect and encase your singular hole-in-one golf ball in this genuine wooden golf ball holder box. Production time for this product is 4 business day(s); expected pickup or shipping date is 04-26-2019.